Qin Shi Huang conquered and united China in 221 BC establishing the Qin Dynasty. He wanted to protect the empire against intrusions by the Xiongnu people from the north, so he ordered the building of a new wall to connect the remaining fortifications along the empire's new northern frontier. Pictured here is the "North Pass" of Juyongguan known as Badaling. 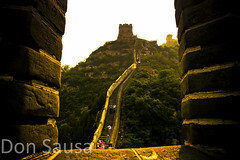 In ancient times, this is one of the most well guarded areas of the Wall as it was the gateway to the capital: Beijing. This picture was taken on top of a guard tower and this would be what a Chinese soldier would see in ancient times.